A History of Preachingbrings together narrative history and primary sources to provide the most comprehensive guide available to the story of the church's ministry of proclamation. Bringing together an impressive array of familiar and lesser-known figures, Edwards paints a detailed, compelling picture of what it has meant to preach the gospel. Pastors, scholars, and students of homiletics will find here many opportunities to enrich their understanding and practice of preaching. 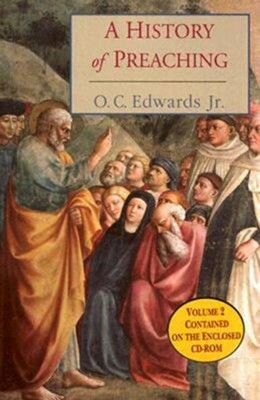 Volume 1, appearing in the print edition, contains Edwards's magisterial retelling of the story of Christian preaching's development from its Hellenistic and Jewish roots in the New Testament, through the late-twentieth century's discontent with outdated forms and emphasis on new modes of preaching such as narrative. Along the way the author introduces us to the complexities and contributions of preachers, both with whom we are already acquainted, and to whom we will be introduced here for the first time. Origen, Chrysostom, Augustine, Bernard, Aquinas, Luther, Calvin, Wesley, Edwards, Rauschenbusch, Barth; all of their distinctive contributions receive careful attention. Yet lesser-known figures and developments also appear, from the ninth-century reform of preaching championed by Hrabanus Maurus, to the reference books developed in the thirteenth and fourteenth centuries by the mendicant orders to assist their members' preaching, to Howell Harris and Daniel Rowlands, preachers of the eighteenth-century Welsh revival, to Helen Kenyon, speaking as a layperson at the 1950 Yale Beecher lectures about the view of preaching from the pew. Volume 2, contained on the enclosed CD-ROM, contains primary source material on preaching drawn from the entire scope of the church's twenty centuries. The author has written an introduction to each selection, placing it in its historical context and pointing to its particular contribution. Each chapter in Volume 2 is geared to its companion chapter in Volume 1's narrative history. Ecumenical in scope, fair-minded in presentation, appreciative of the contributions that all the branches of the church have made to the story of what it means to develop, deliver, and listen to a sermon, A History of Preachingwill be the definitive resource for anyone who wishes to preach or to understand preaching's role in living out the gospel. "...'This work is expected to be the standard text on preaching for the next 30 years,' says Ann K. Riggs, who staffs the NCC's Faith and Order Commission. Author Edwards, former professor of preaching at Seabury-Western Theological Seminary, is co-moderator of the commission, which studies church-uniting and church-dividing issues. O. C. Edwards is an historian and Professor Emeritus of Preaching at Seabury-Western Theological Seminary. He also served as President and Dean of that school. He is an ordained priest in the Episcopal Church. I'm the author/artist and I want to review A History of Preaching - eBook.